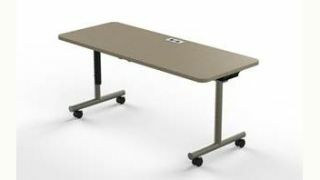 The What: Spectrum Industries has added Flex Flip Tables to the product offerings available in the Expressions line of laminates and metals. The What Else: The Flex Flip Table is built with the same care and attention to details as the rest of Spectrum’s product line. Scratch and impact-resistant high-pressure laminate work surface is made to last while durable powder-coated steel legs add strength and a contemporary look. A work surface brace is incorporated into every table to minimize flexing over time. It also features a spring button on each leg, providing 10 different height options. The Flex Flip Tables can now be ordered in the Spectrum Expressions line of laminate and metal colors that are designed to match the furniture to your room décor. The metal colors provide a tough, wear-resistant finish to metal parts. The laminates cover all work surfaces and the matching vinyl edge trim provides the appearance of elegant, custom-built furniture. The Flex Flip Tables will also be the first in the Expressions Line to offer a white dry-erase laminate finish. The Bottom Line: From active learning environments to meeting rooms, the Flex Flip Table can meet the needs of nearly any collaboration layout, while ADA accessible options allow engagement of nearly any user in any environment. The flip-top and locking casters provide quick and easy room reconfiguration and storage capabilities. Flex Flip Tables are designed, assembled, and shipped from Spectrum’s factory in Chippewa Falls, WI. It is warranted to be free of all defects in materials and workmanship for 10 years.